If you’re familiar with SOAP web services, you likely know that they use Web Services Description Language (WSDL) to document what operations a service provide, what parameters they accept, what they return and so on. This information can be used to generate proxy classes, which you can use to communicate with remote systems simply by calling class methods and all implementation details are handled for you under the hood. While SOAP-based services offer many configuration options (e.g. 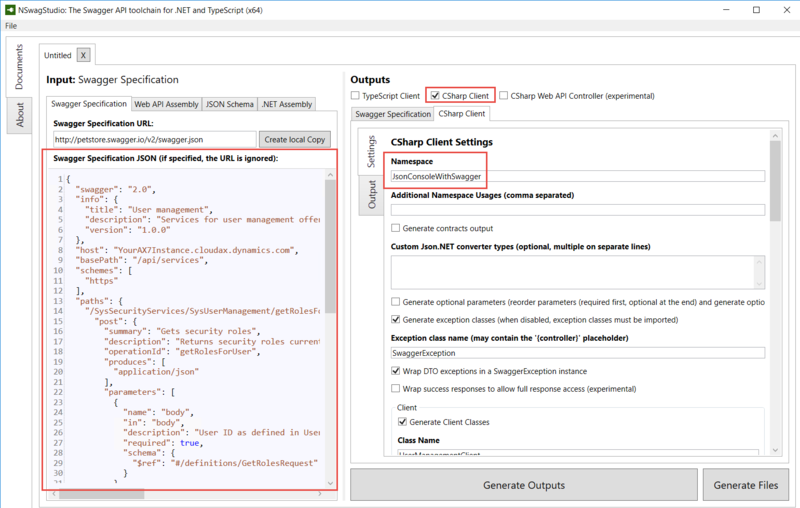 you can switch from TCP to HTTP just by changing a config) and great tooling, sometimes it’s beneficial to use a less sophisticated approach and expose and call services directly over HTTP (that’s why AX 7 added JSON-based endpoints for custom services). Almost everything can communicate over HTTP, it doesn’t require any extra libraries, it’s very flexible and so on. There are some patterns how to design such services (especially REST), but you can do whatever you want. But it means that you have to give up features like code generation of proxy classes. Or not? While HTTP web services don’t have to use any descriptions similar to WSDL, it doesn’t mean they can’t. One of your options is Open API (also known as Swagger), which allows you to describe services in JSON or YAML. There are many tools for working with these descriptions, such as an editor, code generators for many languages, a generator of documentation, you can generate Open API descriptions for your WebAPI projects, there is a support for Open API in Azure Logic Apps, in Azure API Management and so on. Let me show you an example of such a description for a custom service in AX 7 (Dynamics 365 for Finance and Operations, Enterprise Edition). You don’t have to examine it in detail, just notice that it describes available operations, what URL you must use to reach it, what parameters it expects, what it returns and so on, and it also contains additional textual annotations. "description": "Processing inside Dynamics 365 for Finance and Operations failed." The editor can also use YAML (and will offer you to convert JSON to YAML), which is a more succinct format, therefore you may prefer it for manually edits. I intentionally used JSON, because we’ll need it in the next step. Now let’s generate code for calling the service, so we don’t have to do it all by hand and deal with all implementation details of communication over HTTP, with (de)serialization of values and so on. Before you start, download and configure AX service samples from GitHub and verify that they work. Then create a new console application in ServiceSamples solution, where we’ll call a custom service through generated client classes. 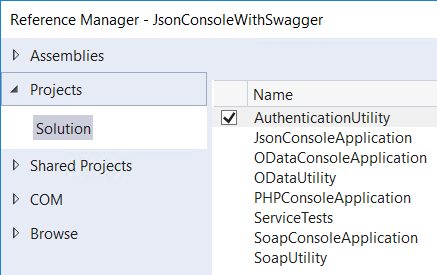 My code below assumes that the project is called JsonConsoleWithSwagger; you’ll have to adjust a few things if you use a different name. Client classes can be generated by several different tools, therefore the following process is just an example; feel free to use other options in your projects. You could use different parameters, such as different Class style, but this will suffice in our case. Then press Generate Outputs, which will generate corresponding C# code. Copy it to clipboard, create a new class in your Visual Studio project and replace the file content with the generated code. We need to add just two things – the actual URL of your AX instance and an authentication header. We don’t want to change the generated code itself, because we may need to regenerate it later and we would lose our changes. Fortunately, it’s not needed – the class is partial, therefore we can create another part of the same class in a separate file and keep generated code and custom code cleanly separated. 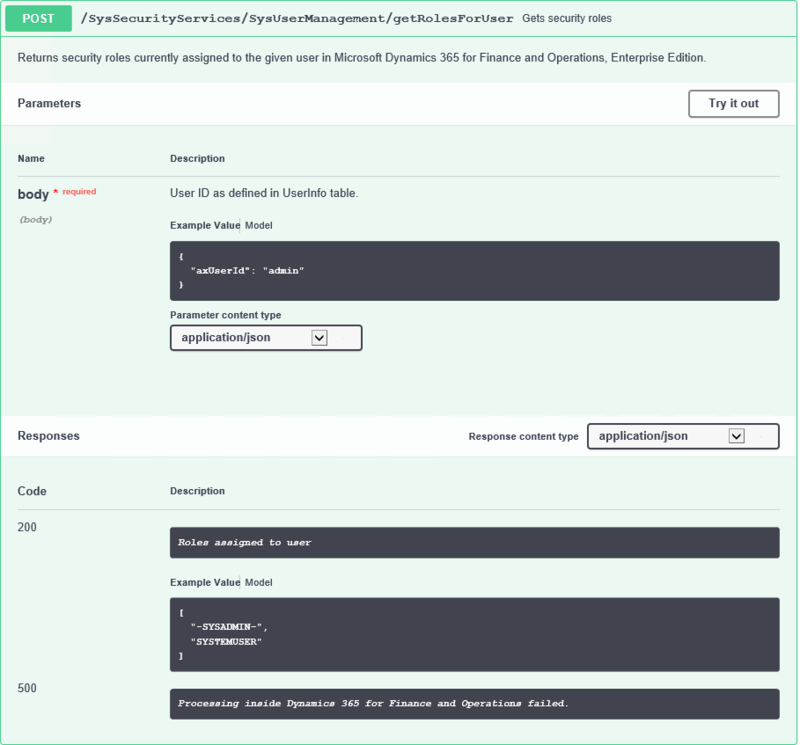 PrependAxInstanceUrl() takes the address of your AX from configuration and puts it at the beginning of the request URL. The last step is adding code to Main() method of Program class to actually call the service. We create a request object (please provide an existing user ID there), create an instance of the UserManagementClient class generated from our Open API document and call the operation. It’s asynchronous, as recommended, but we don’t really need that here, therefore the code immediately asks for the result and waits for it. Then we iterate roles received from AX and puts them into console. That was easy – we didn’t have to bother about what exact parameters the services expects (and we would get a compile error if we did it wrong), we didn’t have to serialize objects to JSON or anything like that. The generator was able to create all the code for us, it just needed to know how the service looks like. In this case, I wrote the Open API document by hand, which obviously took some time. A much better approach would be generating it from metadata of custom services in AX, and while I don’t have such a solution in the moment, it’s definitely doable. Some information is already in place (e.g. getting the list of operation is easy), services and service groups already have properties for description (although they’re currently empty in most cases) and things like parameter description can be included in XML documentation. It still doesn’t cover everything, but additional information can be easily provided in attributes. It’s exactly what Swashbuckle does, e.g. with SwaggerResponseAttribute and RequiredAttribute. I think it’s something that Microsoft should use for its custom services, to provide documentation and to make custom services much easier to consume. Open API / Swagger is a natural choice for this purpose, because Microsoft is a founding member of Open API Initiative and already support it in several products. Maybe Microsoft could somehow utilize Swashbuckle inside the implementation of custom services, instead of building something new from scratch. But even if Microsoft isn’t interested, I believe it would still be useful for many people, therefore the community could build a tool to extract information about custom services and generate Open API documents. It wouldn’t necessarily have to support all features (or not from the beginning); people can easily add textual annotations, examples and so on in Swagger Editor, if needed. But being able to automatically generate JSON-based client classes for any custom service would be really handy.